· What is Parental Control Monitor? · What can Parental Control Monitor do? · How do I check if this software is monitoring? · I can not find the program, where is it? · I can not find the installation files of the program, where is it? · Is it easy to uninstall and out of my control by the kids? · How to restart running after I stop it? · How to access the program when it is invisible? · The install path of the program is set to hidden and now it is not startup, how to find the program? Q: What is Parental Control Monitor? A: Parental Control Monitor, power parental control software for child PC activity and internet online safety. This parental control software applies internet/web filtering, time control, process control, screen monitoring, and other advanced control and management technology to take control of kid online time, filter and block inappropriate internet content or website and monitor what child do online. Q: What can Parental Control Monitor do? 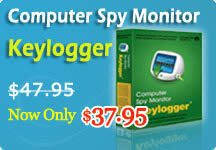 Q: How do I check if this software is monitoring? A: Open "Windows Task Manager" (Press hotkey Ctrl+Alt+Delete) and check the "Processes" list. If you find a process called "wadfngr.exe" listed, this shows that Spy Voice Recorder is running. Q: I can not find the installation files of the program, where is it? A: There is no file placed on the desktop or the Start Menu after installation. And in order to avoid the kids bypassing your control, all installation file are covert. You should enter the whole destination location in the address bar to find the installation folder. So you must remember thisdestination location, especially when you changed the default installation path. By default, you can type C:\Program Files\lyfm and then press Enter. Q: Is it easy to uninstall and out of my control by the kids? A: The program is designed to password access protection. Although the kids can find the progarm running, they can not access the program. Besides, the installation files are invisible, the kids have no way to find the uninstall files to uninstal it. Q: How to restart running after I stop it? A: If you select the function of “AutoStart”, the program will auto run with your computer startup next time; if you don’t or you want to restart monitoring immediately, you should enter the whole destination location in the addressbar to find the installation folder. Then find the file called "wadfngr.exe" under this folder and double click it to activate the program. The default destination location is C:\Program Files\lyfm.